Flash FLV Video Hosting at its finest and most cost effective for volume resellers and client setup. Dedicated hosting gives you access to your very own server connected to the Internet via our high-speed connections to the. The advantages are that services are not shared, the "box" runs just your applications. 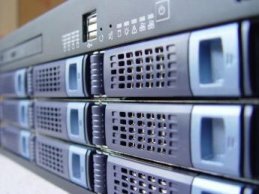 Dedicated servers are best for sites with high traffic volumes, increased security and privacy, and complex requirements not covered in our shared hosting services. We offer IBM or Dell servers on all plans so that you enjoy the ultimate in performance and reliability. Redundant, high-capacity storage subsystems, ideal for applications that outgrow internal server disk capacity. RAID5 arrays with hot-swap hard drives, redundant cooling and power systems and capacities up to 5.6 TB per array. Multiple arrays can be grouped together for effective total storage exceeding 84 TB. Direct-attached SCSI interface provides high-speed disk I/O. Persistent session control maintains client session on the same web server for the duration of the session. Distributes requests to servers based on real-time availability and load. Automatic load re-distribution when servers are added or removed. Load balancing. Single Internet Information Server (IIS) management point for all servers. Single content repository and content propagation. Virtual Web Servers across single or multiple IP addresses. May be combined with MS SQL database failover cluster for total front/back end solution. ** Server set up time may increase if ordered on a Friday Evening. *** NOTE: Unmetered bandwidth does not mean unlimited or infinite – there is no such thing. Unmetered means you can use as much bandwidth/transfer worrying about bandwidth overages or extra charges. The maximum amount of transfer is limited only by the connection you are signed up for. As an example, a 10Mbps Unmetered Connection at full capacity is capable of transferring roughly 7600 GB of data in a month. The 66,000 square-foot facility equipped with fully armed security and office facilities, incorporates a 22,000 square-foot, 18" raised floor data center with full 9 foot ceiling height. In addition to the Data Center, we offer Disaster Recovery suites and seats called "SuiteAssure" and "Seat Assure". The central location, space flexibility and amazing connectivity has made it an ideal home for many Enterprise level and Fortune 500 corporations. Each Data Center is built to the highest standards to ensure the integrity of your business and is manned by highly skilled professionals who are dedicated to providing you with the highest quality and most reliable services available today.